Our New Years Eve party is a time of joyful celebration, as are most, but ours celebrates the new year and our mom’s birthday which is on New Years Day. We bring in lots of snacks, and in fact we almost compete to see who makes the best one. 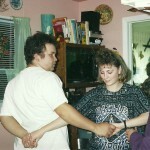 We clear the kitchen of the table and chairs so there is room to dance, because Mom and Dad always liked to dance. There will be lots of visiting tonight, but there will also be lots of dancing. Everyone gets in on the fun, from the littlest kids, to the oldest adults there. The dancers have changed over the years. These parties started when my sisters and I were little kids. As the years have gone by, our spouses and kids have danced on that kitchen floor, and now it’s our kids and their spouses and their children who grace the kitchen floor. The music has changed over the years too, from country, to a little bit rock and roll, to disco, and back to country, and all the dance styles that go with each of those genres. We have seen slow romantic dances, and fast dances that were just because the dancers were feeling happy. If these walls could talk…the stories they would tell. The dancers were festive and the music cheerful. We have had some memorable dances, such as the rubber knee, performed by my brother-in-law, Mike, and for me, it was sweet to see my daughter, Corrie and her husband, Kevin strutting their stuff. I didn’t even know they could dance so well. The many adult/child and adult/baby dances are always dances that put a smile on your face. 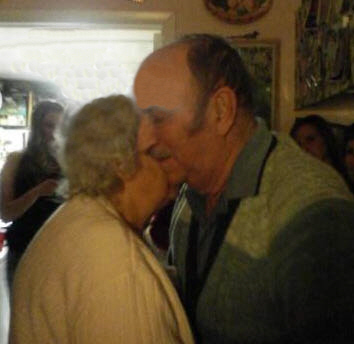 But, the dance that will always hold the place in my heart for the most amazing, special, beautiful dance ever is the dance my parents had after both had been so ill that dancing seemed like it would never be possible for them again. It was a dance that showed their deep, lasting love for each other. 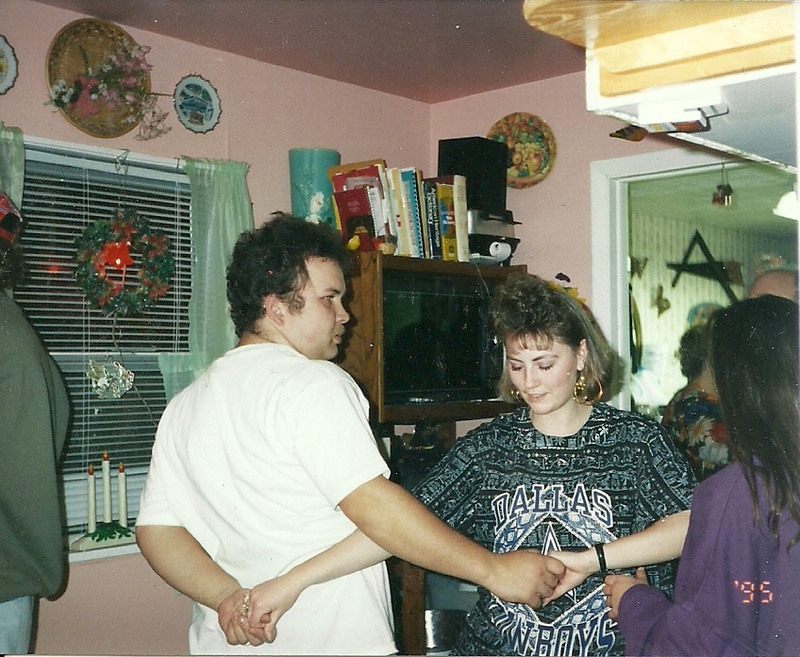 It was a dance that we all gathered in the kitchen to see. The floor was theirs. We didn’t want to dance at that moment. We wanted to watch. It was a beautiful dance…not because of the steps taken, but because of the hearts that had been joined together for all those years…hearts that would belong to each other, forever. When you are little, your best friends are usually your brothers and sisters. 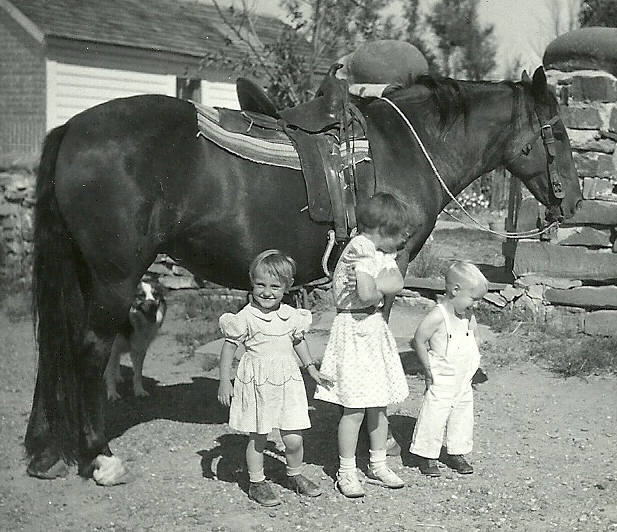 And back when Bob and his sisters were little, there was no such thing as a play date. 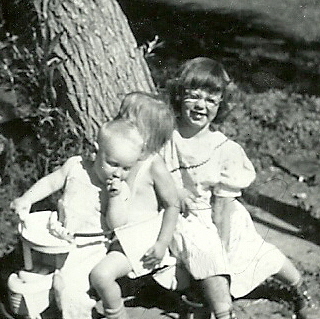 Kids played with their siblings until they started school, and a lot of times after school, especially when you lived out in the country. A lot of times there were no kids that lived very close, so once again, your siblings were your friends, and that wasn’t always so bad. 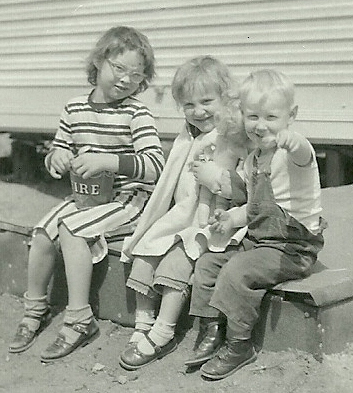 There was always some way to get into mischief when there were three of you. There are also lots of ways to have fun. Who needs to have company over when you have siblings. In this case, three’s company, and fun would be had by all. It might be in the form of trying to put 2 kids into a tricycle built for 1 toddler…the type that had almost a baby walker type seat on it. I have to wonder if Debbie had trouble getting out of that tight spot after she got in…or maybe she had help getting in and out. I don’t know for sure. I just know that it was the same tricycle Marlyce had used as a toddler, so it wasn’t built for 2. 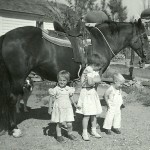 Whether it was playing at home or riding horses at Grandma’s house, this little trio lived life with gusto. They got into trouble on occasion, but not all the time. 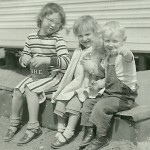 Their imaginations ran wild at times, and when they did…well, the trouble could be bad…for their parents, who had to fix whatever the kids messed up, and from what I’ve been told, this little trio messed things up pretty good a couple of times. Still, when you look at those cute little faces, how could their parents be mad? Many people find themselves living, with no plans to move, in a climate that they are often unhappy with. This would apply to me when it comes to Wyoming winters, but, of course, not the summers. My granddaughter, however, is another story. I never would have expected her to be the one to like the winter, and especially the snow. 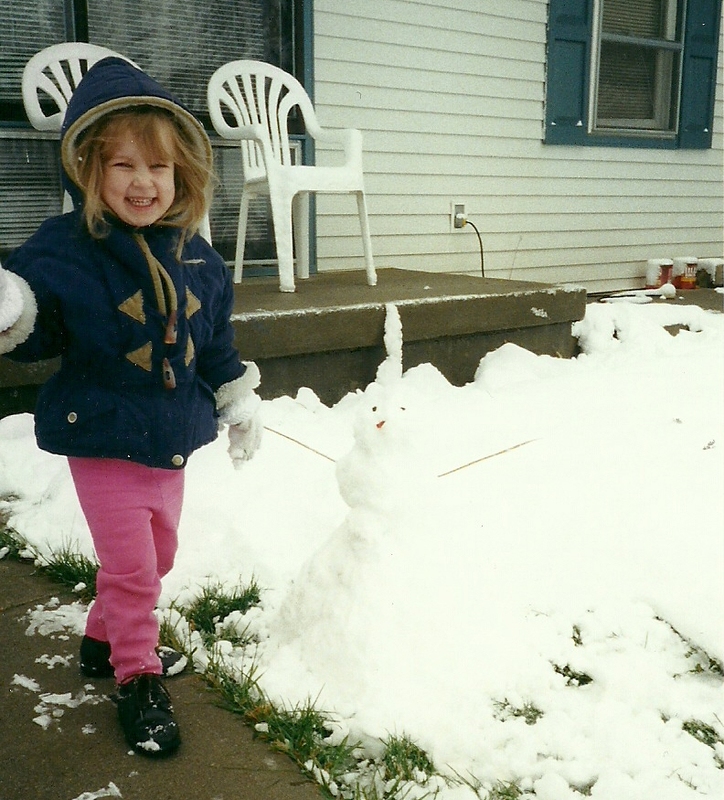 I mean, she did as a little kid, but then most little kids do like the snow…then they wise up…again, my opinion, but Shai still likes the snow today. She wants it to snow a lot from October through March. Crazy kid, but she is my granddaughter, and I love her. Still, on this one issue, we will never agree. We do agree that driving in snow isn’t such a lovely thing, and we do agree that watching it snow, as long as I don’t have to be out in it, is also a lovely thing. On the rest, well…sometimes I think Shai should have been my sister, Cheryl’s granddaughter, because Cheryl absolutely loves winter…every part of it, except maybe for the driving in it. I shouldn’t be so surprised about that, because Shai’s mom, my daughter, Amy maybe should have belonged to my sister-in-law, Jennifer, in that both hate beef, love vegetables and fish, and both could easily live on pasta. I don’t know how I managed to have such a mixed up daughter and granddaughter. Thankfully, the areas that we disagree on are few, and far between. We like many of the same or similar things, but on this one thing, well, I have to say that Shai is crazy concerning snow, and Amy is crazy concerning beef, and I will never change my mind on that one. 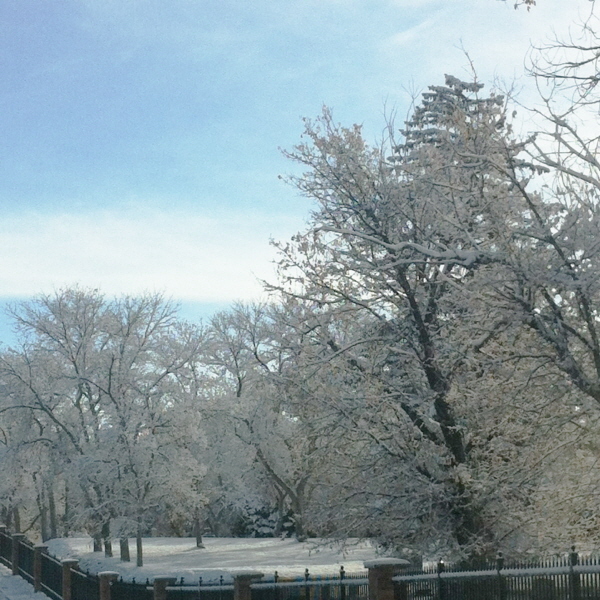 Of course, the snow scenes on Christmas cards, and other pictures is something I doubt if anyone could dislike. As long as you can be warm and cozy in front of a crackling fire with a mug of hot chocolate, those scenes are very nice and create a cozy atmosphere…at least until the reality of just how bitterly cold it is out there, sets in. 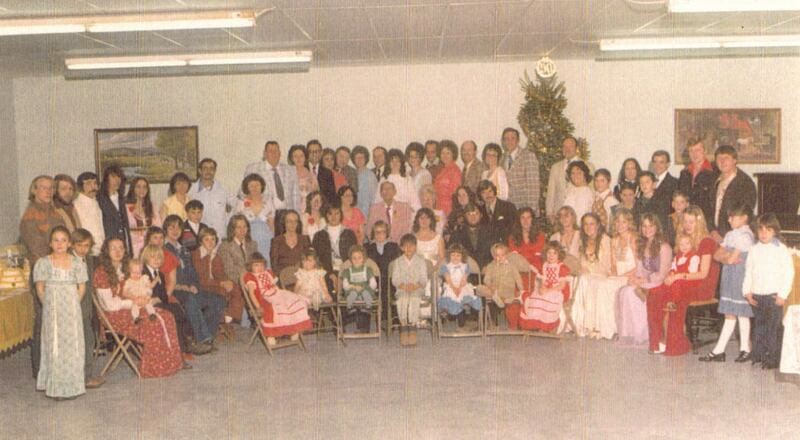 When my older sister, Cheryl got married, she and her husband moved to Keeseville, New York. There was a changing of the guard, so to speak, at our house. Since Cheryl was the oldest, she was always in charge when our parents weren’t at home, but when Cheryl married, the responsibility shifted to me. I’m sure that if you ask my younger sisters, they would tell you that I…maybe took the power a little too seriously…you know…bossy!! Well, maybe extremely bossy. I wasn’t a very patient person back then, so my little sisters quickly learned not to mess with me much. That kind of power can make a person push all their work on to those people who are in a position whereby they have to obey. That was where my little sisters were. 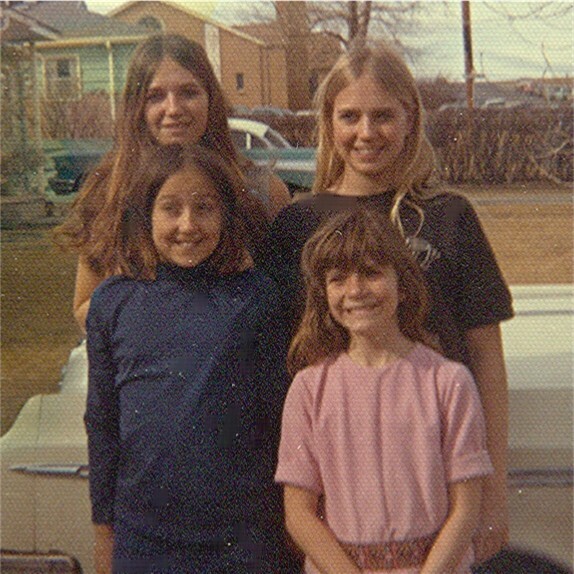 Oh, it wasn’t a constant thing, and my sisters and I had some very good times together, but as anyone who has ever been in charge of their younger siblings can tell you, being the one in charge does have its up side, and that upside is all about getting out of the work of cleaning the house. 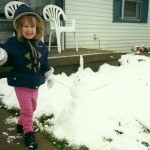 Ok, ok…I know it wasn’t probably the nicest thing to do, but I was a kid after all. That was a long time ago, and we have all grown up. My sisters have long since forgiven me for my big power grab, and we are friends now, but that was a rough time for them…or maybe I wasn’t so different from any other teenager who was in charge of the younger kids while their parents were at work or out for the evening. I like to think that the later is closer to the truth, but I’m also sure my little sisters will still say that I was horrible. All I can say is that it couldn’t have been so bad…I mean, after all, I did let them live!! When you are a young person, you can look ahead to the future, and in your minds eye, you see how things will happen just the way you plan or expect them to be. You have no doubt in your mind that you will become what you plan, do the things you plan to do, go the places you plan to go. It is all up to you. It is your life to plan and live as you choose. Then comes the inevitable curve ball. The moment when everything changes. Your world turns upside down, and the things that seemed important before, aren’t anymore. It can be almost anything, from the loss or serious illness of a parent, as it was in my case, to a car accident, to a unplanned baby, to…well, you get the idea. And in reality, most of us have several of these moments that come to pass in our lives, that are life altering, sometimes for the better, sometimes for the worse, and sometimes…just different than you had expected. I have had several life altering moments in my life, as have most people, such as falling in love with my husband, and choosing to have children and marriage instead of finishing my college education, which changed my future from a teaching career to the one I now have, which is as an insurance agent. For those who know me, you know that my new career choice and the current boss that I have at that job have made all the difference as other life altering changes have occurred. For me the biggest and most traumatic curve ball, came when my dad became ill with Pancreatitis on October 1, 2005, in Canada. My sisters and I drove straight through to Canada, and spent the next 2 weeks at his bedside in Canada until he could be transferred by Life Flight to Wyoming Medical Center. After 4 months and 4 surgeries, Dad was finally able to come home. It would be a long recovery. It was during that time that I found out what my second calling was. I was able to understand the medical jargon and so, became one of his main caregivers. My mother would get sick during that same time with a Brain Tumor, that is gone now. Later my in-laws would be added to my caregiving tasks. 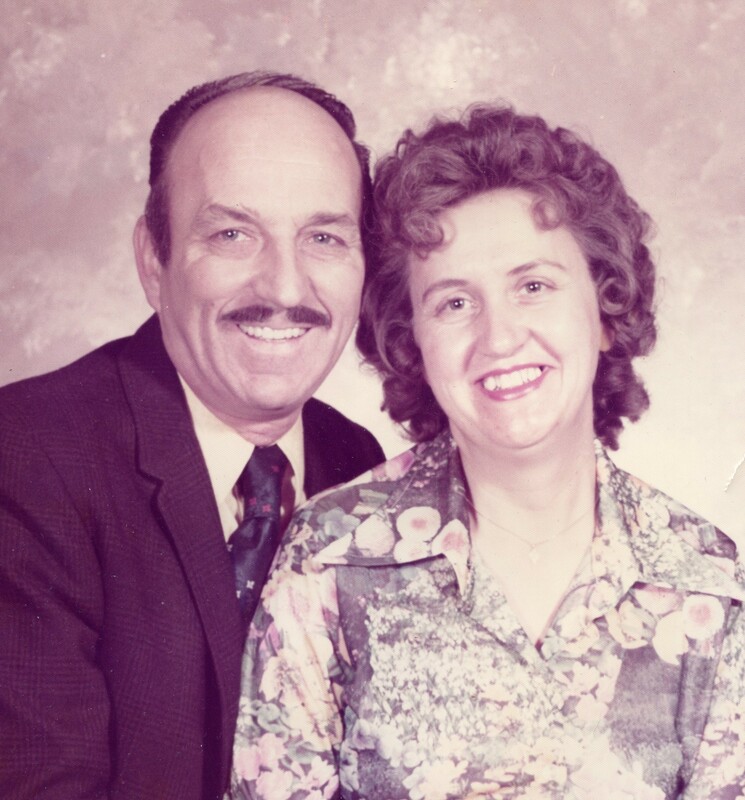 My father-in-law has Emphysema and my mother-in-law has Alzheimer’s Disease. After 7 years of caregiving, I am quite sure I could have been a nurse, except that being a caregiver for elderly people is very hard on your emotions. You know you are fighting a losing battle, and your efforts are only holding off the inevitable. I am not sorry to have taken the journey that my curve ball has taken me on, and it is very rewarding when you win a health battle, even if it is only a temporary win. Looking back, later on, I will always know that I did the best I could do, I gave the very best that I could give, and hopefully, 4 lives were made better through my efforts, and those of the team of people who help me every day. The rush is over, the gifts given, dinner is over, and for most of us…it’s back to work. In many ways, that comes as a relief to me because there are just times that you need to go back to work to rest up. And some holidays are worse than others, some years worse than others. There are some times when you feel like everything went so smoothly that you wish the day would not end so quickly. Then, there are those when you think, “Are we done yet?” The headache won’t go away, and you are so tired you can’t walk another step. Holidays when you think to yourself, “Why am I doing this again? Oh, that’s right, It’s for the kids.” And that is really is true, I think…or is it still that kid inside us all. Even if the actual holiday or even the days leading up to it are hectic, we still find ourselves excited for it’s arrival. The gifts have been bought, and it is our hope that the person we bought them for will be very excited about our choices. We have planned the meal and with our mouth watering, we anticipate meal time’s arrival. After the meal, we are almost…or maybe we just are…too tired to even think of the cleanup, and secretly we hope that someone else will clean it up for us…but of course, they don’t. There is no cleaning fairy to do it. It’s up to you. We drag ourselves to bed that night and think, “I’ll clean up tomorrow.” Then tomorrow arrives, and we wish that we had cleaned up last night, because we don’t feel any more like doing it today than we did yesterday. In fact, the looming cleanup job makes us tired all over. So we head off to work and hope that with enough coffee, we can somehow find the energy to get the job done when we get home. I don’t know about you, but, that day after a holiday is one tough day to swallow, so I’m sure glad that I have lots of help with it these days, and that there is very little clean up left for that day after. 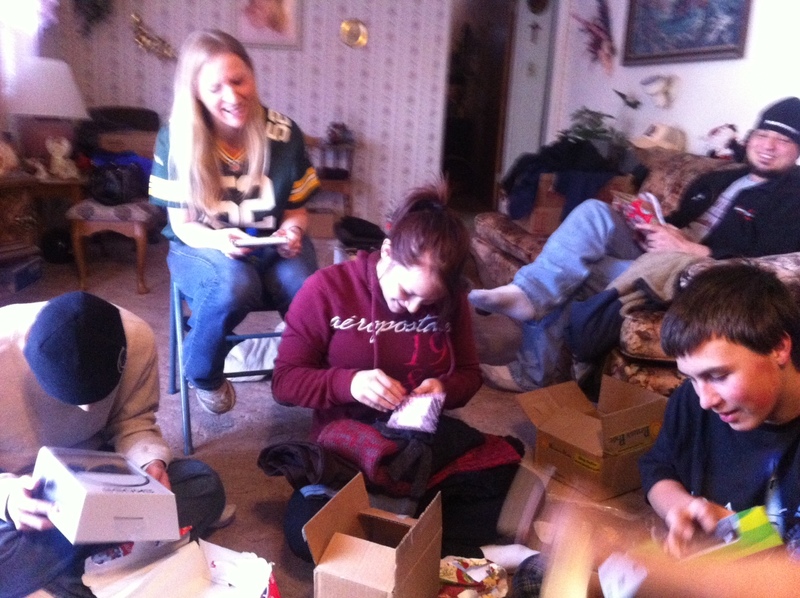 For most people, Christmas is a time of family, friends, and gifts. It’s about showing our loved ones how we feel about them. We gather together and make a big meal, open our gifts, laugh and talk, and in general, enjoy a day off, and all that is great, but sometimes we let ourselves get too caught up in all that, and we forget what Christmas really is about. This day is the birth of our Lord and Savior, Jesus. So many people have politicized this. You aren’t supposed to say Merry Christmas even, because someone might be upset…it might offend them and their religion. But, the reality is that my faith has nothing to do with their religion. I believe in the God of Israel, Jehovah God, because I have seen His grace, mercy, and power at work in my life. It isn’t about my God is bigger than yours, it is about me and my family, and what He has done for us. As a kid, growing up, I had heard of Christians being persecuted. I thought that must have been something that happened many years ago, because I never experienced anything like that…until the past few years. Suddenly, almost as if I just woke up one day, and found out that Christians and Jews are public enemy number 1. I didn’t change anything. I didn’t throw my faith in anyone’s face, but suddenly they are trying their best to force me out. That is something I just don’t understand. The Muslims, Buddhists, Hindus, and even the Atheists are allowed to display their symbols, just not people of Christian or Jewish faiths. I don’t understand that. Don’t we have freedom of religion here? Don’t we have the right to practice our faith as we see fit? It is still our Constitutional right…like it or not. So, today, Christmas Day, I will not give in to political correctness, but I will use my Constitutional rights to freedom of speech and freedom of religion to practice my faith and celebrate Christmas both with my family and the giving and receiving of gifts, but more importantly with a grateful heart. Grateful to my wonderful God, who saw that I would need a Savior, Jesus, because the wages of sin is death and a price had to be paid. Jesus came to Earth, lived a sinless life, and paid that price on the cross, so that I could be saved and have eternal life. There was nothing I had to do but believe in Jesus as my Savior, and there was nothing I could do to get to Heaven on my own. The cross was enough. The debt was paid. How can I not celebrate Christmas, and how can I call it anything but Christmas? I simply can’t. It is not about politics, or whether or not others believe as I do. It is what I believe. 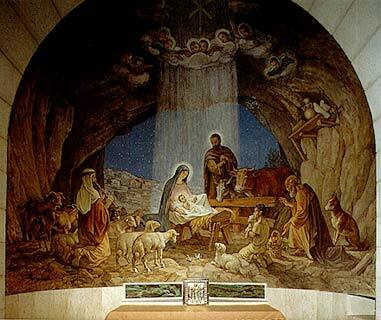 Merry Christmas to All, and thank you Jesus, for coming to Earth to save us. Christmas Eve in 1927 was a special Christmas Eve…at least to my mom’s soon to be large family. That was the day her parents were married. 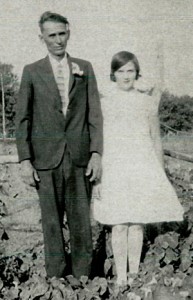 What started with two young people is love, has grown in those 85 years to a family of more than 300 people. There are new babies being born all the time. I know that if Grandma and Grandpa could see their family now, they would be very pleased, but I don’t suppose they would necessarily be surprised. 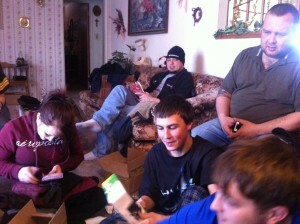 They were surprised at one time, however…or at least in awe. 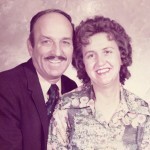 I recall their 50th wedding anniversary in 1977. 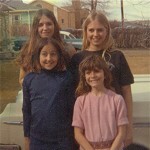 By that time I was married and had two daughters, so I was one of those who were growing the family. It was a wonderful party. Our family has a family Christmas party every year, but this one was very special. 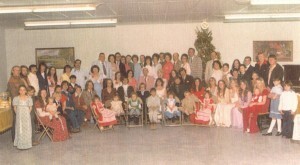 We were celebrating the patriarchs of the family…the ones who, at least in our remembrance, started it all. 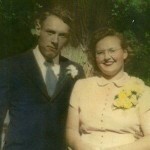 Grandma and Grandpa looked great. They were so happy, but then that was nothing new. 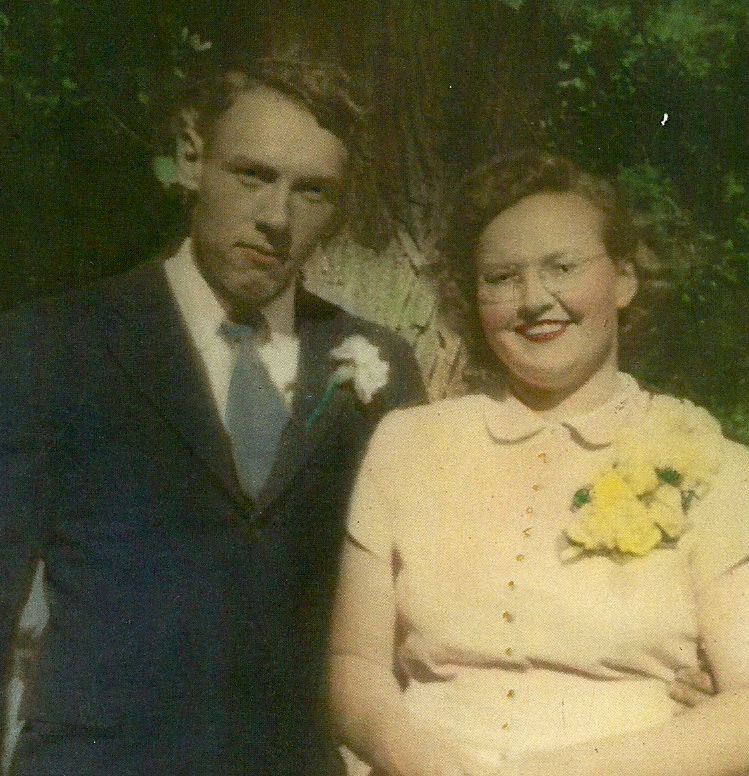 They had been happy all their lives together. 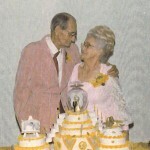 They celebrated life and the joy of living every day of their lives together. Singing could often be heard in their home, as well as the continuing laughter of the little children and grandchildren that loved to spend time in their home. 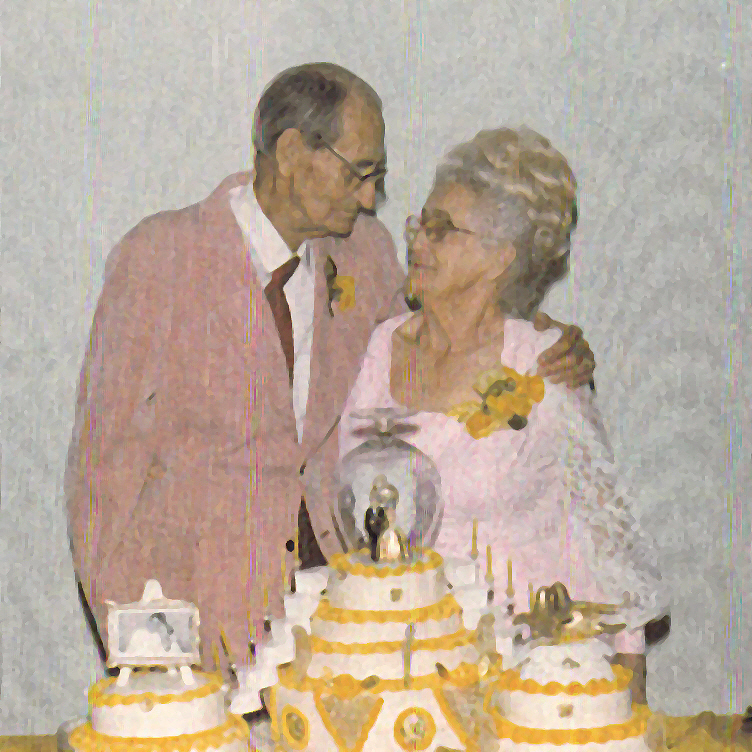 At that special party in 1977, I recall Grandpa and Grandma’s glowing faces, as they looked at each other. You could tell that theirs was an everlasting love…a love that grew bigger with each passing year, and each additional member. They were so happy and they felt so blessed. Their marriage had been such a happy one, and their family had grown to such an amazing size, seemingly overnight. The conversation turned to the size of the family, and Grandpa looked at Grandma and said, “Mommy, look what we started!” He was amazed on that day at the bigness of the family, because when you think about it, who really expects or thinks about how big their family will be, when they are a young couple just starting out. Yes, Grandpa was right. They had started something great on that special Christmas Eve 85 years ago today. My cousin sent me some pictures a couple of days ago and boy, did they bring back some memories. One in particular struck me, mostly because of the difference in the times…and the things you can and can’t do today. My dad’s brother, Bill and his family used to come for visits, and we would go there for visits when we were little kids. 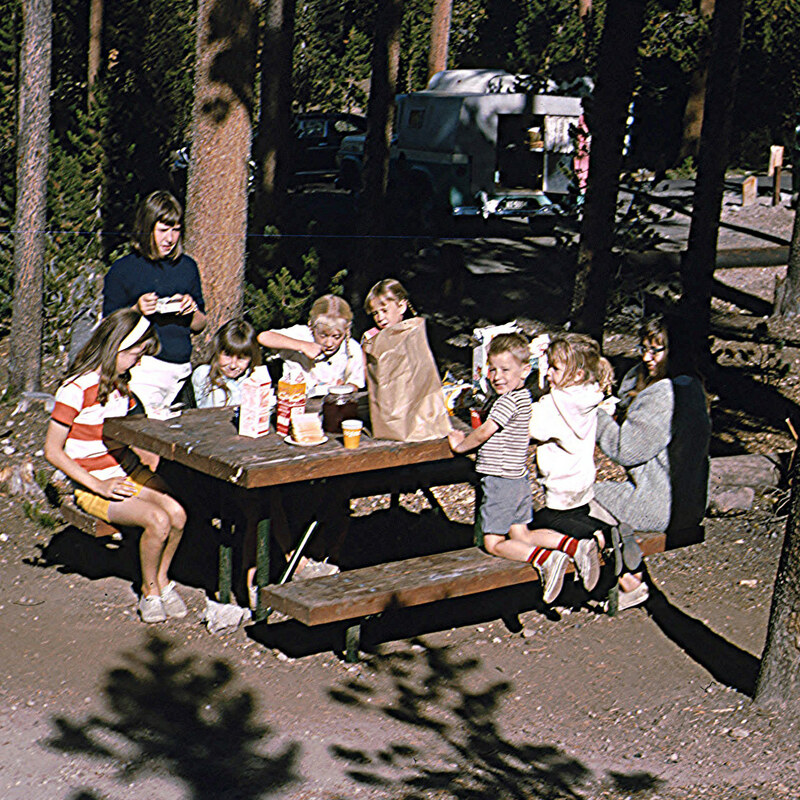 One of our favorite things to do was to picnic on Casper Mountain. It is a beautiful place and it’s nearby. We have always loved going on the mountain. The summer air is cooler there, and fresh with the smells of pine. The birds are singing and the breeze whispers through the tree tops. I could stay up there for a long time. Back then, Dad had an old green pickup truck, and whenever we all went somewhere in the truck, all of us kids got to ride in the back of the truck. Now, I know that people don’t usually ride in the back of a truck any more, and maybe it isn’t the safest idea, but back then it was the normal way to go. On any given day, you might see a dozen or more people driving around with the kids in the back of the truck, and I don’t remember ever hearing about anyone getting hurt or killed, although I’m sure it happened. Nevertheless, when we were going to go up on the mountain, they loaded all of us kids up in the back of the truck and the adults in front. And away we went. We had a great time riding back there, with the wind in our hair…and none of us cared if our hair was a wreck after that ride either. 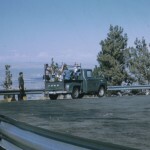 Dad would drive up the mountain, and then stop at Lookout Point so we could see how beautiful the city was from up there. The night views were the best of course, because the city lights always looked like a jewelry box. 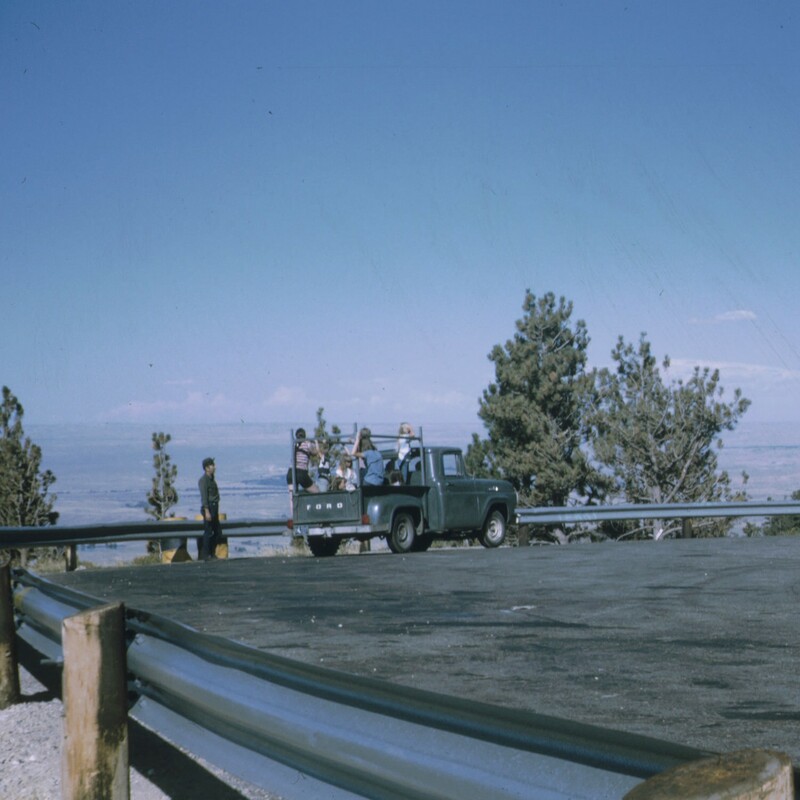 The picnic and the city views were great, but I will always remember the wonderful rides in the back of Dad’s truck, probably because we got to do more of those. Of course, looking back, and knowing the safety risks today, I wouldn’t let my kids or grandkids ride there, but we didn’t know that then, and I guess God just watched out for us, because we obviously lived through it. Kind of like not having seat belts in the car, and rolling onto the floor at a sudden stop. We didn’t think of it being unsafe…just funny. I guess it was just the times we lived in. 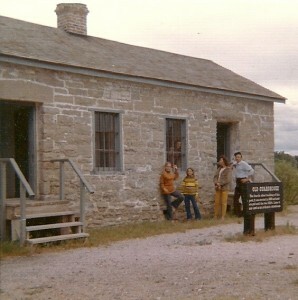 Many of the school children in Wyoming have had the unique opportunity to take a field trip to Fort Laramie, but most people didn’t go there as a family trip. My family, or I should say, my parents, liked a lot of things about the old west, especially any historical sites or trails. Over the years, we went to many of the sites around Wyoming and the surrounding states. 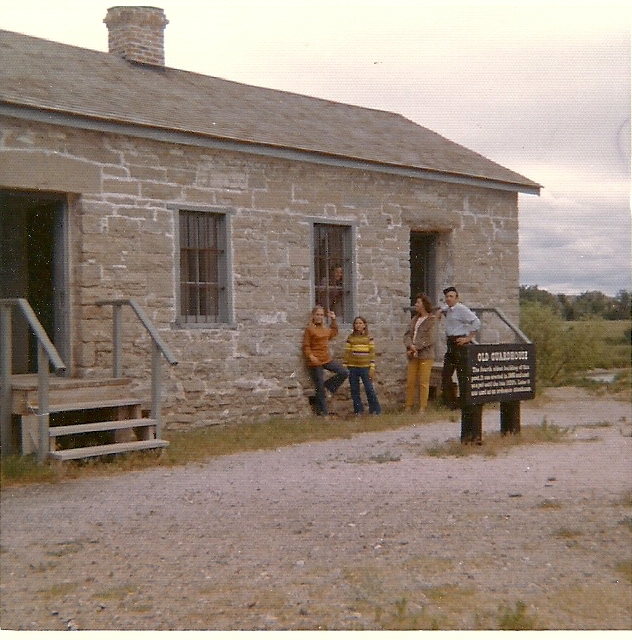 Living in Casper, we have seen Fort Caspar, of course, but there have also been trips to Fort Laramie. One such trip, taken after I was married, and so not including my sister Cheryl or me…something that probably didn’t bother us then, but now, looking back, I’m sorry I didn’t get to go…mostly because Dad’s knowledge of the history of these places, and his love of teasing or role playing at these places always made things interesting. Dad would pretend to be one of the soldiers, or a trapper, or a shop keeper, so that he could pull us into the history of the place…hoping to pique our interest in the rich history of the area we live in. Most of the time, at least as we grew into our teens, his efforts failed to do much for us, other than maybe get a laugh if he was really acting funny, but as the years have gone by, I find myself very interested in the history of our great nation. Fort Laramie, for example, was originally established as a private fur trading fort in 1834, but later evolved into the largest and best known military post on the Northern Plains, before it was abandoned in 1890. It was originally named Fort William after it’s founder William Sublette, and was purchased in 1841 by the American Fur Company and renamed Fort John. In 1949, it was purchased by the United States Army to protect the many wagon trains of migrant travelers on the Oregon Trail. At that time it was known as Fort John on the Laramie River, which later became Fort John-Laramie, and finally Fort Laramie. As a side note, the Laramie River was named after Jacques La Ramee. In 1815 or 1816, Jacques and a small group of fellow trappers settled in the area where Fort Laramie would later be located. He went out alone to trap in 1819 or 1820 and was never seen again. Arapaho Indians were subsequently accused of killing La Ramee and putting his body in a beaver dam. The river was named “Laramie” in his honor, and the name would later be given to the Laramie Mountains, the fort, and the towns of Laramie, Wyoming and Fort Laramie, Wyoming. Today, I find all that history very interesting, but as a kid, history seemed like dry memorization of names and dates. Now I think I wouldn’t have minded living in those exciting times, or maybe just have the ability to travel back in time once in a while to see what The Old West was all about. I suppose I am a little too tech-minded to really have enjoyed that more primitive time for very long. Nevertheless, I guess my dad accomplished his goals with me. I do love the history of The Old West.